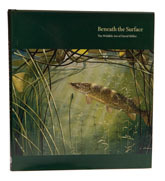 Even at the best of times, the supply of books on angling could never have been described as a flood and nowadays there aren’t many publishers left who will consider anything that mentions the word fish, so it was with great pleasure that I opened the cover of Beneath the Surface. Inside this large format volume are some of the most appealing paintings and line art it has ever been my privilege to review and the quality of the reproduction is absolutely beyond reproach – be prepared for a serious treat. Langford Press have enjoyed considerable success with their ‘wildlife art’ series and David Miller was an obvious choice from their point of view, but as a fisherman, it is impossible not to appreciate this book. David is a keen angler and learnt his fish portraiture the hard way, by diving to view his subject in their natural habitat – it sounds kind of extreme, but when you compare David’s art to virtually anybody else’s, it is impossible not to be conscious of the difference, not least because most artists paint fish as they appear in the hand, rather than as they do underwater. David’s fish look as if they belong there, even when the subject is a pilot fish in a sunken aeroplane. The plates are generous and accompanied by explanatory text and photographs; with sections on coarse, game and sea fish I don’t see how anyone could turn this down.